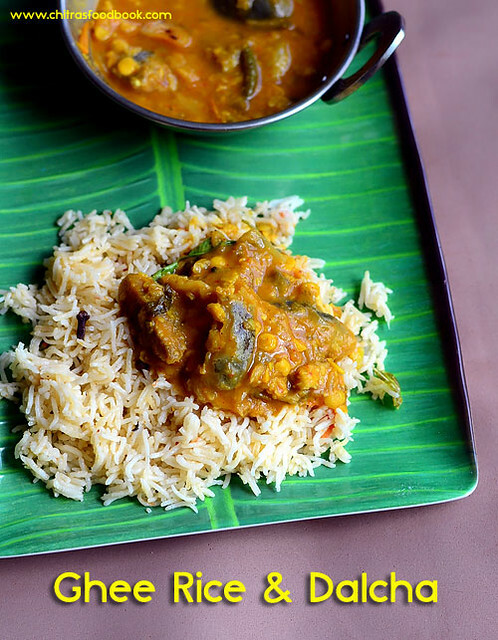 When I shared Muslim wedding biryani & Kuska recipes in my Biryani series, few readers asked me to share Muslim home style Brinjal gravy ( Kathirikai Kuzhambu) for biryani. I did share an Ennai Kathirikai Gravy for biryani. But later I realized it was not the one my readers asked for. Again I got a mail and a comment in my biryani recipes to share Muslim Veg Dalcha recipe which is served as a side dish for ghee pilaf/Nei choru and they call it as Bahara Khana. Its very special among Nagore,Tamilnadu and Hyderabad Muslims. 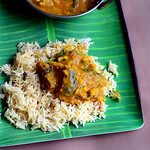 I started searching for the authentic recipe and found it in Jaleela Kamal mam’s blog. 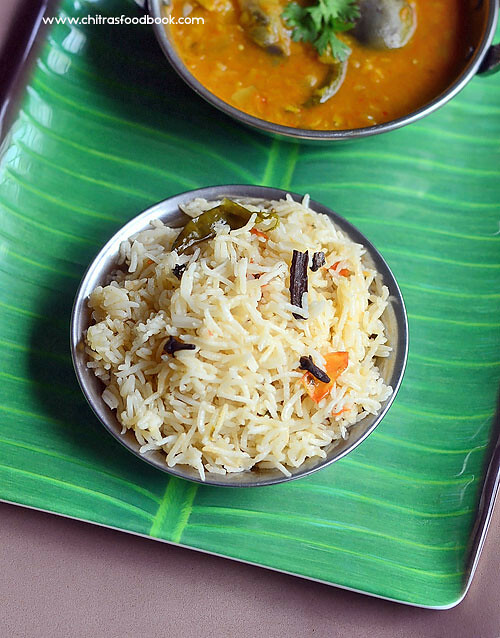 Recently when I was telling about Thalcha kuzhambu to my dad, he told he had tasted it in his friend Mr.Ibrahim uncle’s house & called him immediately.I talked with his wife Sharmila Banu aunty and got the recipe for Dalcha along with ghee rice. She told they make dalcha with mutton & vegetables. But she suggested me to use brinjal and bottle gourd as I asked for a vegetarian version.It was very similar to Jaleela mam’s recipe.It is so easy and quick to make. So I was double happy and satisfied of trying the authentic, original, traditional Muslim style Dalcha gravy recipe.You can prepare Dalcha and ghee rice simultaneously if you have 2 pressure cookers in hand. Sharmila aunty told me to use DUM method for making ghee rice just like Hyderabadi biryani . But I did it in my cooker directly as I started cooking very late. Soon I will try to make a detailed and perfect ghee rice post. Aunty was sooo sweet and patient. She spent nearly half an hour over phone and shared many of their specialty recipes for Iftaar and Ramadan . I must try to post them one by one soon . Thanks a bunch Aunty and Jaleela Mam for sharing this wonderful Dalcha recipe.Now lets see how to make South Indian Veg Dalcha gravy with step by step pictures. Check out my 40 Veg Biryani Recipes too ! In a pressure cooker base, take the toor dal + Chana dal and soak it adding 2 cups of water. Soak tamarind in 1/2 cup of warm water separately in a bowl. Open the cooker after the steam is released. Mash the dal well with a whisk or mathu. To this, add chopped brinjal & bottle gourd ( and Mutton pieces if using), salt, red chilli powder and dhania powder. Again pressure cook in high flame for 1 or 2 whistles just for the brinjal to cook. Brinjal should retain its shape. ( ** Refere NOTES for an easy method)Open the cooker after the steam is released and add the tamarind extract + Mango pieces ( If adding). Mix everything and check for taste.Add more salt , chilli powder based on your taste. Let the mixture roll boil well. Heat ghee in a small pan and saute cinnamon, clove, sliced big onion. Saute till onion turns golden brown.Remove and add it to the boiling dal mixture. Switch off the flame and remove it. Garnish with coriander leaves and serve hot with Ghee rice or biryani. Enjoy ! For ghee rice : Wash and soak basmati rice in 2 cups of hot water for 20 minutes. In the mean time, chop the onion, tomato, slit green chilli. Heat a pressure cooker with Oil +ghee and splutter the whole garam masala items. Add the chopped onion, green chilli, g&g paste and tomato pieces ( skip tomato if u want white pulao). Saute until tomato turns mushy.Now add 1 cup of water and 1/2 cup of coconut milk and soaked basmati rice ( U can use water or coconut milk completely) . Add the required salt and add chopped mint+coriander leaves, few drops of lemon jucie.Mix well and pressure cook in low flame for 1 whistle. Remove after the steam is released. Fluff the rice with a fork and serve it. Keep dalcha as the side dish ! This combo tasted simply great : )) Enjoy !! 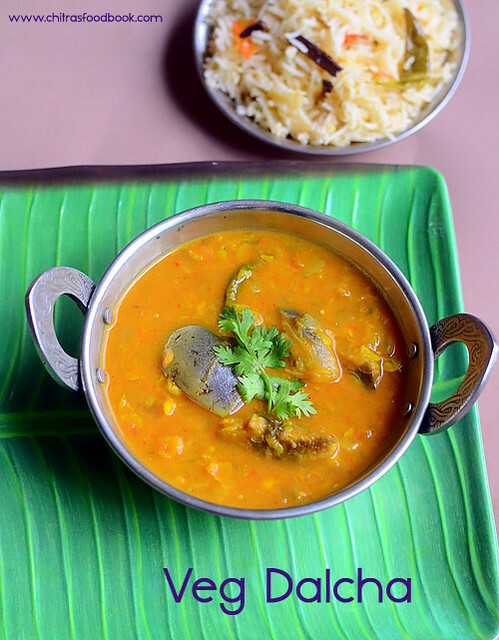 **While making dalcha, you can keep the brinjal pieces in a small bowl inside the cooker and cook all the other ingredients together.After opening the cooker, mash the dal well, add the cooker brinjal pieces and then you can add tamarind extract, give a boil & temper it. By doing this way, you can avoid pressure cooking for 2 times. I just followed what Aunty told me. So I have cooked twice here. Next time, I am planning to try this method. If you want to follow DUM method for making ghee rice, Just add the rice, water, coconut milk and mix well till all the liquid is absorbed by the rice and becomes thick. Now switch off the cooker. Heat a dosa pan well ( Use a very old, unused dosa pan) and Place the cooker over it. Cover the cooker with a cotton cloth and then place a plate or lid. No need to use the cooker lid. Above this, place a bowl full of hot water. Let the flame be high and dosa pan be very hot. This heat will spread to the cooker and rice cooks soft n fluffy. Remove the cooker after 10 minutes and check the rice. This was the method suggested by aunty. Soon I will try to make a detailed post for this. By doing this way, color of rice can be maintained white. 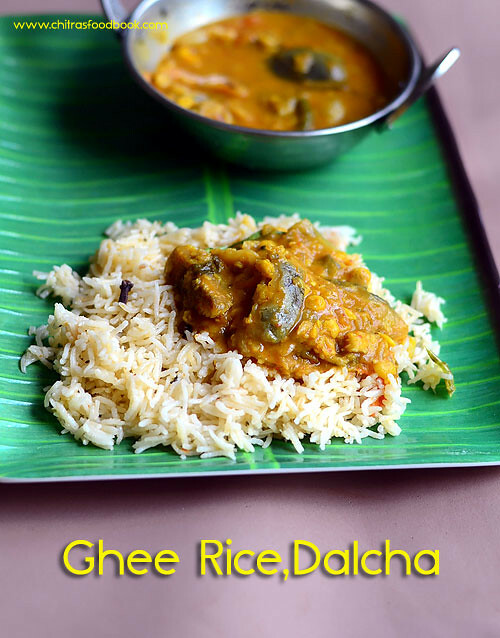 Try and enjoy this most popular Muslim style Ghee rice + dalcha combo at home. I am sure you will love it. I made this and some curd rice for our Sunday lunch. It was comforting ! Hi Chitra, I am happy to hear that you tried and tasted my veg (mango) Dalcha. Enjoy our Traditional Flavors of Muslim dishes.Thanks. We do dis by cooking the dals mutton together in a cooker.. and on the other pan we starts to temper with whole garam spices followed by onion gg paste chillipowder in oil.. den add water masala powders vegetables (Raw Banana brinjal mango) until cook and add tamarind juice along with cooked dals.